As you know, until recently you could only upload pictures to Instagram stories if they were no older than 24 hours. That’s very inconvenient, especially if you’re traveling and don’t want to spend the entire vacation editing Instagram pictures and plan on sharing them later instead, or if you’re an active Instagram creator with your posts planned out and prepared weeks in advance. Luckily, all that has changed now - you can just go to go to your camera roll, gallery or saved photos, choose a pic and upload it to Instagram stories for the whole world to see - there is no more need to hack Instagram to get around the limitation. Here’s a step-by-step guide on how to how to add pictures to Instagram story from camera roll. 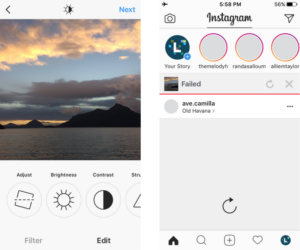 Before you upload a picture to Instagram stories, make sure you update the app - you want to have the latest version to take advantage of this feature. Secondly, open the app, go to your feed page and swipe right to get to the Instagram story page. Open the photo gallery by swiping up - you should see a header that says either “Last 24 hours” - that’s if you’ve taken any pics or videos in that time, or regular “Camera Roll” - if you don’t have any new pics. Once you upload a photo, you will see a tag with the date the photo was taken on it. You can delete it if you want - just drag the sticker downwards to the trash can that will appear, or you can choose to keep it. If you want the sticker to remain on the pic - try changing its size, location and color to better suit your picture. As you know the 2018 Instagram update strongly favors users who create lots of content regularly, actively interact with their viewers and post to stories as often as possible. However, constant story presence can be difficult for many people, and especially for businesses, especially if they don’t have employees responsible for Instagram presence working on weekends. If you’re running a business, you know that most days there may not be anything exciting or worth sharing with your followers happening and this probably prevented you from posting content to stories often. But now it is much easier to plan your content for both stories and regular feed in advance! This ensures that you your stories contain only quality material all the time. 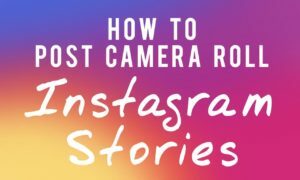 So if you’re still looking to promote your business or personal Instagram account to get more likes and followers, go through your camera roll - you will easily find dozens of story-worthy pictures to post, which will help you get more Instagram exposure.